Over 300 teachers participated in the DAN Teaching Middle School RE Workshops (Yrs 7-10) with Dr Felicity McCutcheon in March and June 2012. Many thanks to Felicity, to the schools who hosted her, and for the support of those who attended. You can find details of other resources and Conference papers by Felicity in this newsletter. Australian & New Zealand Curriculums. If you are interested in contributing to the Conference, or have any suggestions for Keynotes and Workshops, the DAN EO would be delighted to hear from you. Further information will be posted on the DAN website and in e-newsletters when confirmed. Following the appointment of Eleanor O'Donnell to the Chaplaincy staff at Geelong Grammar School, applications are now being sought for a full-time Chaplain for Wadhurst, the middle school campus (Years 7 & 8) of Melbourne Grammar School commencing in Term IV, 2012. Applications close 5pm, Wednesday 25 July 2012. 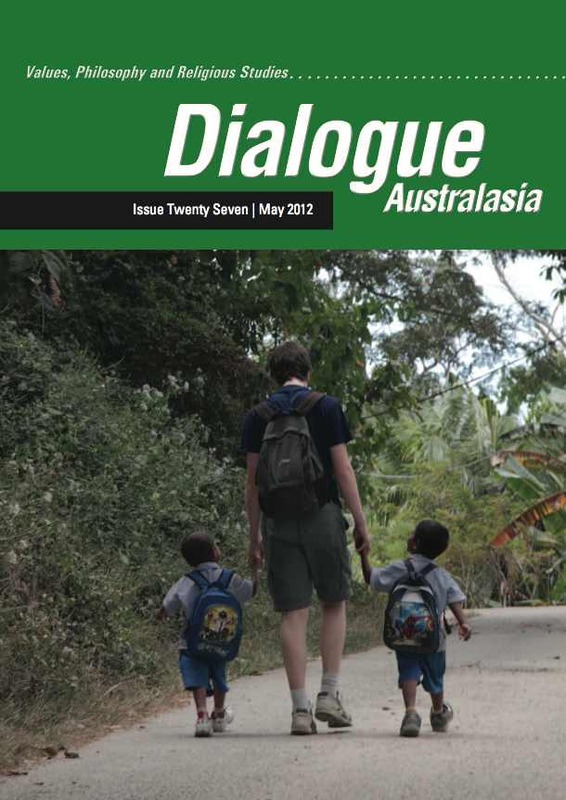 The 27th Issue of Dialogue Australasia journal was sent to DAN Members and subscribers in May. Back Issues: Do you have a full set of 27 journals in your school library to refer to? Copies of most back issues can be ordered from the DAN EO (Click here for further information). To assist you in identifying and accessing past articles, an online archive of articles has been started. Articles marked with an * are available for download in pdf format here by current DAN members only (using your password). More articles will be added to this online archive and in time, articles will be grouped thematically. Yrs 7-9: Sample 5 Stands Beginners Curriculum Offered as one possible way into teaching RAVE for new and non-specialist teachers. Includes a curriculum matrix, schemes of work, and additional resources including teaching notes, assessment tools and two stand alone units. Yr 11 & 12 Unit: What Does Make the World Go Round? 2002: What is Philosophy and how might it be incorporated into Education? 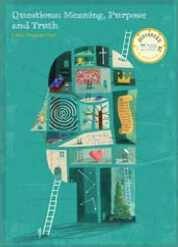 Edited by Stephen Pett, this resource is designed to help students aged 11-16 explore questions of meaning, purpose and truth with a particular focus on Christian and secular responses. It contains original source material and creative teaching ideas, enabling students to explore the place of prayer in helping people find meaning in life, the questions of truth in religion and science, the challenge of finding purpose in ordinary existence and in thinking about ideas of happiness. SCIENCE & BELIEF: THE BIG ISSUES - NEW! A new resource from Professor Russell Stannard, Emeritus Professor of Physics at the Open University. There are 12 videos, freely available on YouTube (120 mins of stimulis material) designed for 16-19's and for more able students aged 11-14. The videos are supported by a set of free discussion notes for teachers to assist discussion and provide follow-on activities (written by Lat Baylock of RE Today Services). Topics include: Creationism; Intelligent Design; The Galileo Trial; Miracles; The Anthropic Principle; Freud; Jung; Memes and Extra-terrestial Intelligence. Although you can freely access all of above online, copies of the package on a disc including the video programmes and notes can also be purchased from RE Today. Science and Belief - The Big Issues was published as a book by Lion in May 2012. In it Russell Stannard explores the themes of the videos in greater depth. Graphing the History of Philosophy: a fascinating graphical representation of who has influenced who. The source of the map is Wikipedia, so there is plenty of scope to argue and debate the lines of influence and add/delete your own ie; a good catalyst for discussion in your senior philosophy classes (and your ICT students would also get excited as it is visualised using gephi). An Atlas of Faith: one for the RE classroom now... Sourced from Der Spiegal and based on data from 2003-2003. Speaking of data about religion, have you read the latest reports charting Australia's current religious landscape? 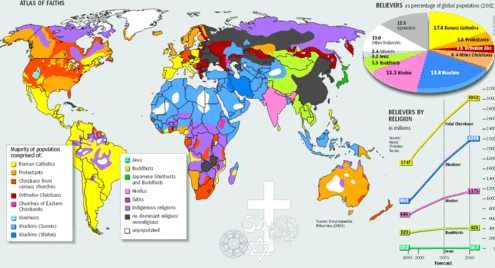 Buddhists now near Presbyterians in numbers and Buddhists and Muslims each outnumber Baptists and Lutherans. Check out an analysis of the 2011 Australian Census religious data by Gary Bouma. GAIA: GREEK GODDESS OF EARTH by Joe Jenkins of EthicsOnline, won the Environmental Award in the 2012 Campfire Film Festival at ACMI in May 2012. By comparing the life of the planet to the life of a 45 year old woman, Gaia takes us on a breathtaking journey from our beginnings to these last few seconds of biological time which have witnessed our meteoric rise to ascendancy - but at what cost? For a short time, this brilliant teaching resource is available to watch in full as part of the Campfire Film Festival. You can order the DvD of the film with accompanying teachers notes and classroom activities from EthicsOnline. The films are very well researched, balanced in the spread and weight given to different views, and colourfully presented. They provide excellent discussion starters, and give teachers ample opportunities to help students think critically about some of the most important ethical issues of our time. They are an excellent antidote to the ‘just do it’ mentality so prevalent today. Environmental Ethics, Sexual Ethics, War & Peace and Abortion.